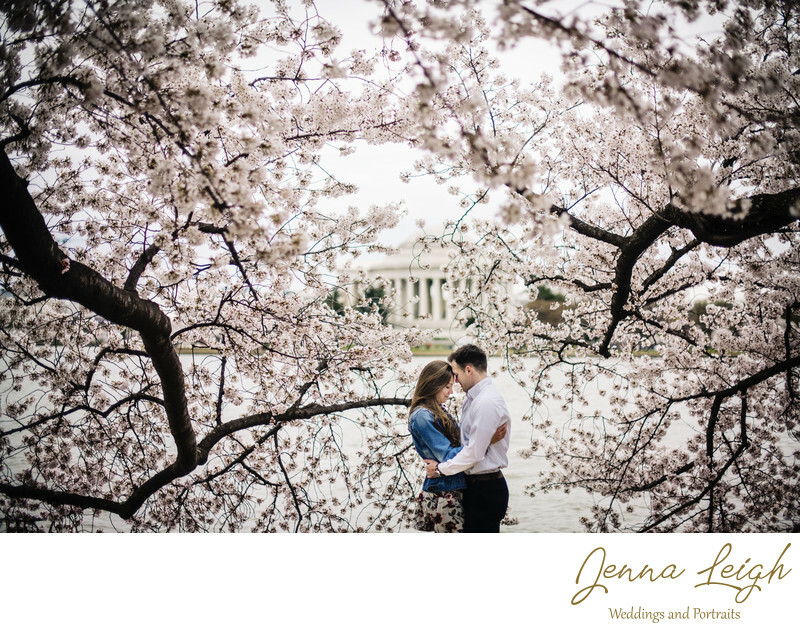 The cherry blossoms are a magical event that happens yearly in Washington, DC. Despite the crowds, it is an absolutely gorgeous location for engagement portraits. I love using the trees as a way of forming a frame around my couple or photographing through the trees as a way of adding color, texture, and interest to the photos. This photo was taken at the Tidal basin on the opposite side of the Jefferson memorial. The tidal basin is one of the most famous locations to witness and experience the beauty of the DC cherry blossom festival. One thing to consider with the National cherry blossom festival in Washington DC is that you cannot always predict when the trees will bloom or what the temperature will be. The 2018 bloom date was altered multiple times and fell on a date where temperatures were well below 20 degrees. You must be flexible in your wardrobe choices. Parking can be an issue and if the weather is nice and warm expect large crowds. Engagement sessions will need to be early to avoid peak traffic time, and a little walking from your car to the trees may be necessary. But as you can see it's worth it when breathtaking images are created for you to enjoy forever and which commemorates such an iconic DC event. Location: 701 E Basin Dr SW, Washington, DC 20242.